I was diagnosed with type 1 diabetes when I was 7 years old. I had started rock climbing a few years prior to my diagnosis. Climbing takes many forms in my life. I compete in rock climbing events in climbing gyms. The vast majority of our family vacations are spent climbing outside on rocks, as well as mountaineering and ice climbing. All of these present different challenges in diabetes management. For example, one of the things that I discovered during competitions is that my blood sugar can shoot up before I compete because of adrenaline. I quickly learned that if I treat those highs my blood sugar will crash while I’m competing. Before any type of climbing, I try to have very little active insulin on board because once I start moving my blood sugar will plummet. As a result, I try to avoid high carbohydrate foods for at least 2 hours before climbing. I’ve also found big differences in the way I need to manage my blood sugar during continuous exertion, such as mountaineering, and more sporadic, strength-based exercise, such as bouldering. For continuous exertion, I turn my basal level down to almost nothing 30-60 minutes before we start climbing and eat a lot of fast-acting glucose throughout the day. For more sporadic exercise, I find that my blood sugar drifts up if I turn my basal down. Instead, I will turn my basal down a little bit and keep an eye on my continuous glucose monitor so that I can take in some glucose when I start trending down. It can sound tedious, but thinking about all of this enables me to do some really cool things in really cool places. This summer, my family (my parents and my sister) and I traveled to the Pacific Northwest with the objective of climbing Mount Rainier. Mount Rainier is 14,411 feet tall and is the most glaciated peak in the lower 48 states. One of the things that makes it an interesting climb is the different types of terrain that are covered on the way to the summit, requiring a wide range of mountaineering skills. It’s a challenging climb. Only about 50% of climbers reach the summit, even among guided groups. We took on the additional challenge of guiding ourselves. 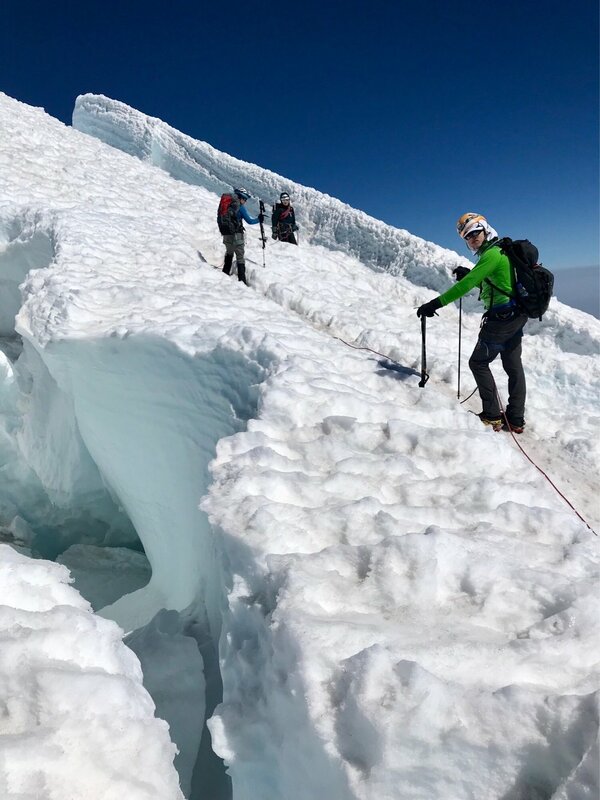 Liam stands next to a massive crevasse on Mount Rainier. We spent our first week in the Mount Rainier area doing acclimatizing hikes up to around 10,000 feet. We live at sea level and needed time up high to adjust to the altitude. I also used these early hikes to tweak my diabetes management. I figured out how early I needed to turn my basal off before we started climbing and how much glucose I needed per hour (around 30-40 grams) to not go too low. I also discovered that I was not drinking enough water, which was causing headaches and abdominal pain. I switched from water bottles to a water bladder inside my backpack, which made it easier to drink enough water while climbing. rock that crumbles under your feet. The route is winding, with lots of switchbacks. The rangers mark the route with sticks topped with reflective tape. Route finding in the dark was still pretty challenging on this part of the climb. We reached the top of the Cleaver and were back on the glacier just before sunrise. This upper part of the glacier presents its own challenges, most notably the ever changing crevasses that can be 300 feet deep. While the narrower crevasses can be crossed with a long step, rangers set up ladders to span the wider ones. This part of the climb was also very long and winding because we had to go around wide crevasses that could not be crossed. We also felt the effects of the altitude more strongly on the upper part of the mountain. It became much more difficult to catch our breath above 13,000 feet. We finally reached the summit around 9 am. What no one tells you is that the summit is not the highest point that you can see as you are climbing. Instead, you have to cross a volcanic crater and climb the other side to the true summit. That last bit of climbing to the true summit was painful. After resting and signing the summit register, we started the long climb down to camp. We packed up our tent and other equipment and hiked the remaining 4 miles down to the parking lot, once again with our heavy packs and in the dark. We got back to our Airbnb about 24 hours after we had started climbing. It was an amazing day that I will never forget. The climb was more complicated because of my type 1 diabetes, but it didn’t stop me.